Young Phoebe is raised as a Southwestern belle, which made her a genteel gal who was also a great rider and roper. One day she enters the territory rodeo to compete against the ill-mannered Tumbleweed Gang and their reign as champions is over. 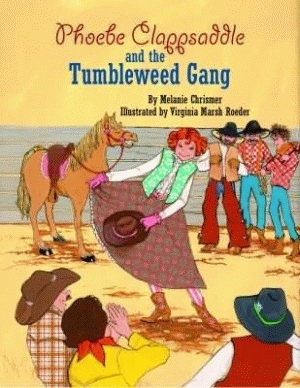 Clifford, Elmo, and Eustace Tumbleweed decide to get rid of sissified Phoebe Clappsaddle once and for all. But Phoebe fouls their devilish plot and teaches the boys some manners, too. Then, for a time, the desert blooms in the territory again. This thirty-two-page hardback and jacketed book is beautifully illustrated with the colors of west Texas. Illustrator Virginia Marsh Roeder uses collage effects to depict patterns from the cowboy’s shirts to the diamonds on a rattlesake’s back. The thirty-one illustrations complement the amusing story with delicate teasing and bristly fun to delight kids and grownups alike. Readers will enjoy the details of desert animals and faces with western character, or characters with western faces, that is. Melanie Chrismer is a fifth-generation native Houstonian who lived her elementary years in New England. She is a former newspaper stringer, who worked in libraries, schools, and bookstores while developing her writing career. Melanie, her husband, daughter, son, and schnauzer live in northwest Houston. Ms. Chrismer is a member of the Society of Children’s Book Writers and Illustrators. Virginia Marsh Roeder has been an advertising artist, graphic designer, and an illustration artist. She is a retired St. John’s School (Houston) art teacher. Ms. Roeder is a member of the Society of Children’s Book Writers and Illustrators. This light-hearted tale is colorfully illustrated with large, whimsical pictures depicting scenes from the West. Click here for the Phoebe Clappsaddle Series study guide.